PESHAWAR: Police resorted to teargas shelling and baton charge Tuesday to disperse Afghan Taliban who attacked a procession of Revolutionary Association of the Women of Afghanistan (RAWA) and caused injuries to several women. The Peshawar police, which accompanied the procession right from Shaheen Town to the Defense Colony, swung into action soon after the Taliban attacked the processionists and chased and beat them up. The police also arrested 13 of them. The RAWA procession comprising some 250 women and girl students of the local Afghan schools was attacked near Tambwano Chowk on Jamrud Road by a group of over a dozen stick-wielding Taliban. At least 10 women received injuries, three of whom were rushed to hospital for first aid. The women showed extreme courage by raising highly charged slogans against the "fundamentalists" and retaliated with sticks and stones in self-defence rather than running for shelter. They were joined by some of the men, both Afghans and Pakistanis, accompanying the procession. "We wanted to convey to the 'fundamentalists' that women can fight for their rights," remarked an emotional RAWA leader Nasima Bareen. The attackers were overpowered by police in no time. 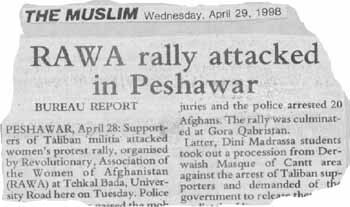 Mindful of the wrath of the Taliban and other Afghan groups, the RAWA organizers had arranged bundles of sticks in advance for observing the "6th black anniversary" of what the organization termed "swarming of fundamentalist criminals into Kabul on April 28,1992." Despite tension and fears of recurrence of the happening, the processionists did not disperse and reached their destination chanting slogans and playing patriotic songs through a loudspeaker. "Nothing can be achieved in today's Afghanistan without sacrifice," commented another RAWA leader, Jamila Habib. The situation would have taken yet another ugly turn had the 300 stick-wielding Taliban both Afghans and Pakistanis from the nearby Jamia Imdad-ul-Uloom Islamia of Masjid-I-Darwish reached the scene of incident on time. After having heard about the incident, the Taliban rushed there but by then the Afghan women had dispersed peacefully. The angry Taliban blocked the main Peshawar-Jamrud road near Peshawar Club for sometime and searched the passenger buses for the Afghan women who took part in the procession. The Taliban procession marched to the Tambwano Chowk and disrupted traffic on the busy University Road. The prominent feature of the RAWA procession, which traversed a distance of two kilometers, was the hanging of the effigies of five Afghan leaders atop a vehicle. They included Taliban spiritual leader Mulla Mohammad Omar, former president Burhanuddin Rabbani, former prime minister Gulbuddin Hikmatyar, Hezb-I-Wahdat chief Ustad Karim Khalili and Uzbek warlord Gen Abdul Rashid Dostum. 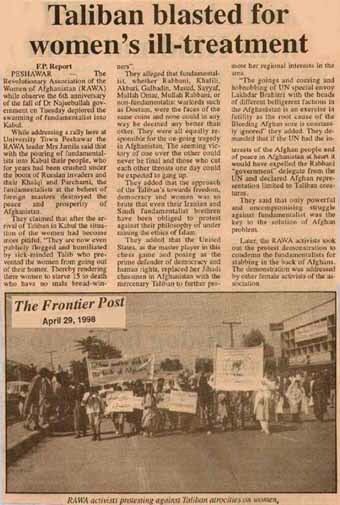 The RAWA leaders said these Afghan leaders "playing in foreign hands" were responsible for the on-going genocide in Afghanistan. The Taliban chief Mullah Omar was depicted as a "pirate." The Afghan women were all praise for the local police who took timely action to trace down the attacking Taliban despite the fact that no proper permission had been secured for staging the demonstration in Peshawar by RAWA. 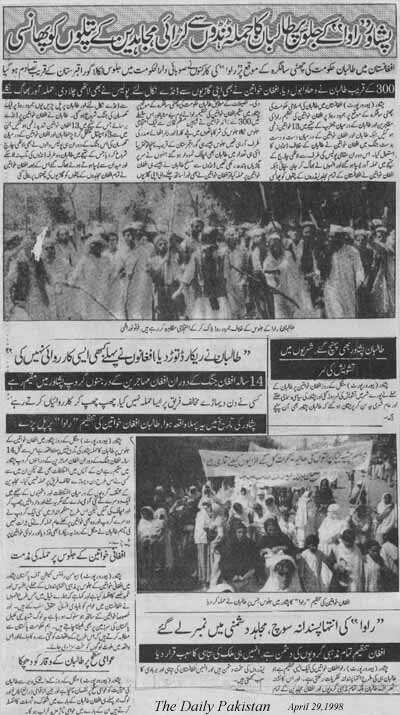 It was the Quetta-based RAWA's third show in the city as the organization in the past chose to stage such protests in Quetta and Islamabad due to fear of various head-line Afghan groups in Peshawar the main target of the speeches and sloganeering of the processionists were the Taliban, who were blamed as "stooges of Pakistan". The young schoolgirls were more vocal in condemning the Afghan leader. "Marg bar (death for) Taliban, marg bar Rabbani, marg bar Hikmatyar, marg bar Masud, marg bar Khalili, marg bar Dostum, marg bar Sayyaf, marg bar Akbari" were the slogans which echoed all the way on the route of the procession. The RAWA members also condemned the alleged interference by Pakistan, Iran, Uzbekistan, Tajikistan and Saudi Arabia in Afghanistan's affairs. Meanwhile, Afrasiyab Khattak, vice chairman of Human Rights Commission of Pakistan, Pakhtoonkhwa condemned the Taliban attack on RAWA activists and demanded stern action against such elements. In a statement, Khattak said it was violation of human rights and the government of Pakistan must take notice of the developments taking place on its soil. He also appealed to the democratic and progressive forces to the country to come forward and ward against the prowess of "darkness". Afghan women and schoolgirls (above) holding banners and placards take out a protest procession in Peshawar on Tuesday. Below religious students (Taliban) are taking out a baton-wielding procession in reaction to RAWA's anti-Taliban demonstration. PESHAWAR, April 28: Supporters of Taliban militia attacked women's protest rally, organized by Revolutionary Association of the Women of Afghanistan (RAWA) at Tehkal Bala, University Road here on Tuesday. Police thrashed and tear gassed the mob and rounded up 20 Afghan nationals. Four persons including a woman received minor injuries. 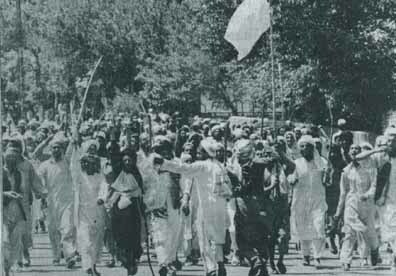 The procession was taken out to observe black day against the occupation of Kabul by Taliban who entered the capital city of Afghanistan on April 28,1992 and toppled the communist regime of Dr Najeebullah. According to details, hundreds of RAWA workers aboard vehicles reached at University Town from Gulbahar and started march. The participants, holding effigies of Uzbek militia war-lord General Rashid Dostum, former president Professor Rabbani, Gulbuddin Hikmatyar, Khalili and Mullah Rabbani and chanted slogans against the Taliban militia, leaders of warring factions and foreign interference in the war-town country. They also held placards and banners inscribed with, "Murdabad fundamentalism" and "long live democracy". A heavy contingent of police and Frontier Constabulary (FC) cardoned off the road which resulted in big traffic jam. When the procession reached Takhal Bala at 11 am the women raised slogans against Taliban and a group armed with batons and pistols attacked the rally, which created panic. The youngsters also pelted the procession with stones and bricks. However, the police and FC Jawans resorted to baton-charge and tear-gas to disperse the attackers. Four persons including a woman sustained injuries and the police arrested 20 Afghans. The rally was culminated at Gora Qabristan. Latter, Dini Madrassa students took out a procession from Derwaish Masque of Cantt areas against the arrest of Taliban supporters and demanded of the government to release them, immediately. However, police said that the arrested persons were released which were kept at Town Police Station and handed over to Maulvi Abdul Qadir. Earlier, in a statement RAWA strongly condemned attack on the procession and termed it an ample proof of brutality. Our staffer adds: The RAWA passed a resolution which was distributed among the demonstrators said, "Criminal fundamentalists, whether Rabbani, Khalili, Akbari, Gulbuddin, Masoud, Sayyaf, Mullah Omar, Mullah Rabbani, or non-fundamentalist warlords such as Dostum, are all identical in their odious entities and none can in any way be deemed any better than the other. They are all equally responsible for the on-going tragedy in Afghanistan. The seeming victory of one over the other can never be final. They termed United States of America as the master player in this great game of Chess. PESHAWAR - The Revolutionary Association of the Women of Afghanistan (RAWA) while observe the 6th anniversary of the fall of Dr Najeebullah government on Tuesday deplored the swarming of fundamentalist into Kabul. While addressing a rally here at University Town Peshawar the RAWA leader Mrs Jamila said that with the pouring of fundamentalists into Kabul their people, who for years had been crushed under the boots of Russian invaders and their Khalqi and Parchami, the fundamentalists at the behest of foreign masters destroyed the peace and prosperity of Afghanistan. They claimed that after the arrival of Taliban in Kabul the situation of the women had become more pitiful. "They are now even publicly flogged and humiliated by sick-minded Talib who prevented the women from going out of their homes. Thereby rendering there women to starve 15 to death who have no male bread-winners". They alleged that fundamentalist, whether Rabbani, Khalili, Akbari, Gulbuddin, Masoud, Sayyaf, Mullah Omar, Mullah Rabbani, or non-fundamentalist warlords such as Dostum, are all identical in their odious entities and none can in any way be deemed any better than the other. They are all equally responsible for the on-going tragedy in Afghanistan. The seeming victory of one over the other can never be final, and those who cut each other's throats one day can be expected to gang up. They added that the approach of the Taliban's towards freedom, democracy and women was so brute that even their Iranian and Saudi fundamentalist brethren have been obliged to protest against their philosophy of under mining the ethics of Islam. They added that the United States, as the master player in this chess game and posing as the prime defender of democracy and women was so brute that even their Iranian and Saudi fundamentalist brethren have been obliged to protest against their philosophy of under mining the ethics of Islam. They added that the United States, as the master player in this chess game and posing as the prime defender of democracy and human rights, replaced her Jihadi chessmen in Afghanistan with the mercenary Taliban to further promote her regional interests in the area. "The goings and coming and hobnobbing of UN special envoy Lakhdar Brahimi with the heads of different belligerent factions in the Afghanistan is an exercise in futility as the root cause of the Bleeding Afghan sore is constantly ignored" they added. They demanded that if the UN had the interests of the Afghan people and of peace in Afghanistan at heart it would have expelled the Rabbani "government" delegate from the UN and declared Afghan representation limited to Taliban creatures. They said that only powerful and uncompromising struggle against fundamentalists was the key to the solution of Afghan problem. Later, the RAWA activists took out the protest demonstration to condemn the fundamentalists for stabbing in the back of Afghans. The demonstration was addressed by other female activists of the association. PESHAWAR, April 28: A group of Afghan women on Tuesday staged a demonstration against the UN-OIC sponsored talks between Taliban and Northern Alliance here. The activists of Revolutionary Afghan Women's Association (RAWA) were demanding representation to moderate, and peace-loving Afghans in any talks on future of Afghanistan. The RAWA activists carrying placards and banners inscribed with slogans against the talks, said the parleys were not for peace, but would only bring more destruction in Afghanistan. Addressing the rally, the RAWA leaders asked all the neighbouring countries, including Iran, Saudi Arabia, Tajekistan and the US to refrain from meddling in the internal affairs of Afghanistan and leave the Afghan people to settle their problems through Loya Jirga and establishing peace in the war-torn country. The procession started from Shaheen round about and marched towards Hayat Avenue near defence colony in cantonment area. A group of Afghan youth presumed to have affiliation with Taliban militia on Jamrod Road tried to stop the women from heading forward and to disrupt it. However, the women started pelting stones and beating the young Afghans. In the meantime a strong contingent of police also intervened, resorting to baton charge and arresting some of the youth as the remaining were forced to flee away. The RAWA activists demanded establishment of a democratic set up in the war-torn country and expressed its determination to continue its crusade against "fundamentalism" and "Chauvinism". The peaceful women processionists chanted slogans against what they termed as "so-called" jehadic forces, involved in the bloodshed. They blamed these self-styled leaders of quarrelling each others in greed of power and in the process involving themselves in the massive genocide of innocent Afghan people. The RAWA activists bitterly criticised the Taliban Islamic movement who, they alleged, were discriminating against Afghan women in the name of religion. Peshawar - To convince the UNO and other mediators for giving representation to moderate, peace-loving and democratic-minded neutral and independent Afghan groups in the ongoing Islamabad talks the women from Afghanistan staged a peaceful demonstration here on Tuesday. The protest demonstration was organized by the Revolutionary Association of the Women of Afghanistan and it was arranged on the occasion of 6th anniversary of hard-liner's empowering in Kabul. 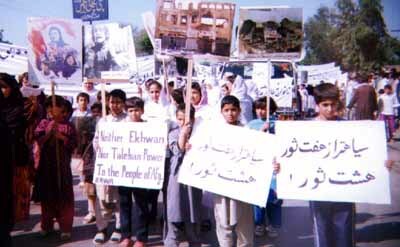 Having banners, placards and posters in their hands, more than one thousand Afghan women, mostly those who have lost their bread-earners in the last 20 years in fighting were assembled in Shaheen Chowk on Peshawar-Torkham road and amidst chanting slogans in favor of their demand, all of them proceeded in a procession towards Hayat Avenue near to Defence Colony. The protesting women through their slogans were criticizing both the Jehadic leaders and hard-line Taliban along with their foreign masters who according to the protestors have broken away brutalities record of the former Soviets and their puppet Khalqis and Parchamis. In this connection they displayed examples of Jehadic and Taliban leaders brutalities against the innocent and helpless Afghan women and other civilians through photographs and portraits. They have also chanted slogans against those foreign countries included Russian Federation, India, Pakistan, Saudi Arabia, Iran, United States and other foreign countries who are financing their puppets inside Afghanistan and fueling the infighting in that country. At one stage, some bearded and turban holding young Afghan made an attempt to disturb the peaceful demonstration and they entered into skirmishes with the protesting Afghans and their male supporters. The protesting Afghan women not only pelted stones on youngsters but physically beaten away a few of them. However, the contingents of police squad succeeded in controlling the situation with using minor force including lathi-charge and teargas shells against the rivals Afghans who were busy in skirmishes against each others. Continuing their peaceful protest demonstration from Shaheen Chowk till Hayat Avenue, the protesting RAWA activists and stalwarts also chanted slogans against Jehadic leaders like Engineer Gulbadin Hikmatyar, Prof. Rabbani, Ustad Rasool Sayaf, Karim Khalili, Rashid Dostam, Mullah Mohammad Umer and Ustad Akbari and held them responsible for genocide of the innocent Afghans and destruction of their motherland. However, they did not criticise other Afghan leaders particularly warlord Ahmad Shah Masood. On their way from Shaheen Town till Hayat Avenue, a group of male supporters of RAWA and others also distributed leaflets which was declaration for Tuesday demonstration. Through this declaration, the RAWA condemned Iran, Pakistan, Saudi Arabia, Turky, Uzbakistan, America and others for useless interference in the affairs of Afghanistan as well as for patronising the hard line Afghan groups. At the behest of these foreign countries, some of the so-called Afghan leaders are bent upon destruction of their motherland as well as killing their helpless and innocent countrymen. The RAWA severely criticised the UNO and OIC who focused all its attention on those war mongers who are involved in fighting against each others. It made it clear that outcomes of ongoing Islamabad talks would not be different from those of Peshawar, Islamabad and Jalalabad agreement. In this regard, the RAWA reaffirmed its demand for convening a meeting of Afghan loya jirga, enabling the genuine representatives of Afghans to set across a table to find out an early solution to their conflict. The RAWA through its communiqué as well as through slogans severely denounced the Islamic Movement of Taliban for its unrealistic attitude towards women. Such puppets of Pakistan, USA and Saudi Arabia are interpreting the holy religion of Islam wrongly and defame it. The RAWA declared that its peace-loving, patriotic and democratic-minded members would continue to struggle against unlawful and inhuman policies of Taliban. Later on, on arrival at Hayat Avenue, the protestors were dispersed peacefully. Peshawar - The Taliban's Islamic Movement under a well-planned programme, attacked a peaceful procession of Afghan women at Peshawar on Tuesday morning. Sources informed that after coming to know about the women procession, arranged by the Revolutionary Association of the Women of Afghanistan (RAWA) in connection with observing a black day on the occasion of 6th anniversary of Mujahideen's govt. in Kabul, the Taliban leaders issued directives to their supporters of various religious institutions. The students and teachers of various religious institutions finalised a plan for attacking the protest procession of women. The processionists when arrived at Tehkal Bala, in the meantime some bearded and turban-holding Afghan youngsters attacked the women protestors with sticks. 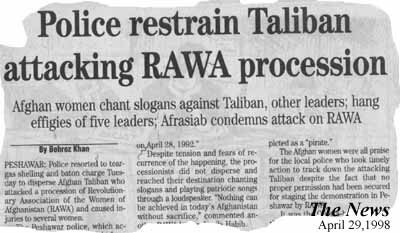 However, the male supporters of RAWA came to rescue the protestors and they entered into skirmishes with the Taliban. PESHAWAR (NNI): The activists of Revolutionary Afghan Women Association Tuesday held a protest demonstration against the talks in Islamabad between the Taliban and the Northern Alliance at Jamrud Road. The RAWA activists, carrying placards and banners inscribed with slogans against the talks, said the parleys are not for peace, but they would only bring more destruction in Afghanistan. The police avoided volatile situation when the supporters of the Taliban reached Jamrud Road and raised slogans against RAWA. Police used lathi charge in time to disperse the Taliban supporters and the RAWA activists. Addressing the rally, the RAWA leaders asked Iran and Saudi Arabia to refrain from interfering in the internal matter of Afghanistan. They said only Afghan people are capable of establishing peace in the war-torn country. The RAWA leaders bitterly criticized the Afghan leaders, saying their infighting has led others to meddle in Afghan affairs.